Agnes was my great grandmother and she is one the people I have had difficulty finding information about, especially before she came to Canada. According to census documents, Agnes was born in April of 1859 in Ireland. Online family trees seem to identify her father as Alexander McAllister but I can't find the name of her mother. She may have had a brother Ephraim who went to Horn Hill, Alberta. Agnes married William Simms in March of 1880 and shortly after they set sail for Canada aboard the ship "Montreal" from Liverpool, England. They arrived in Quebec City on June 15, 1880 according to passenger lists found on Ancestry.ca. Their son William was born October 26, 1880. In the 1881 census of Canada, the family of 3 can be found living in Dundas County, Ontario by the small town of Mountain. William Sr. is listed as a farmer. Agnes and William went on to have eight children, including my grandfather, Alexander, and she lived in Mountain most of the rest of her life. When her son William died in 1945, she was living in Kemptville according to his obituary. This would have either been with her daughter Eleda or in a care home. 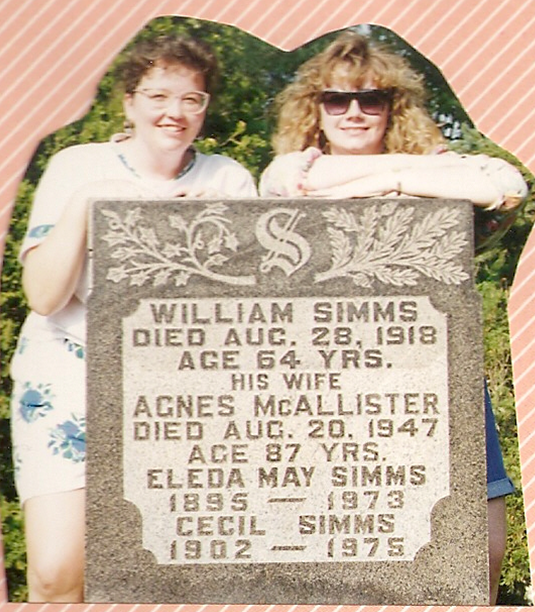 It would seem Eleda was a nurse or the family caretaker as she came to Manitoba to care for her sister in law when she was sick, my Grandma Mary Simms. Thursday, August 2, 1945. Cliff, Gwen and I went into Mountain for mail. Went up to Kemptville to see Grandma. Aunt Elida came home with us. Monday August 13, 1945. Luella brought Gwen and I up to Bryan's to get Aunt Mary then went up to Kemptville to see Grandma. Tuesday, August 14, 1945 Hilda, Aunt Mary, Gwen and I went up to see graveyard. Carl took Gwen and I into Ottawa at night. Train was late. Saw V-J celebrations in Ottawa. Got on train about 11 o'clock. Agnes died 67 years ago this week, August 20,1947 at age 87 and is buried in South Gower cemetery south of Ottawa. My sister and I visited the rural Ontario area where our grandfather came from in 1990 before I really took an interest in genealogy. It amazes me now to think that we really had no idea if anyone we were related to would be in that cemetery as we drove by and decided to go in. We didn't know where to look or who we were looking for but were almost led to this grave! I used the self-timer setting on the camera (the original selfie) with a perfectly placed stone on the next row to take us both in this photo. Serendipity? I'm heading back down there on Tuesday, Devon has a game on a field just west of Mountain!